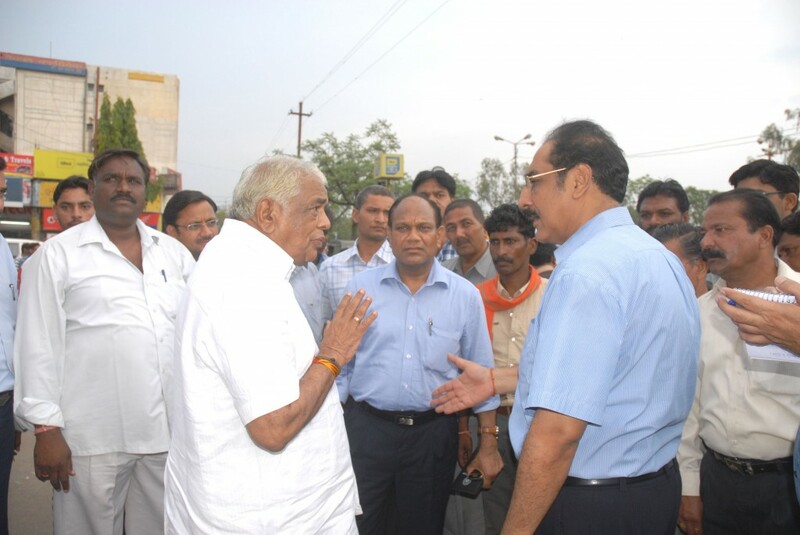 Bhopal, July 5, 2012 (Ataullah Faizan): Urban Administration and Development Minister Mr. Babulal Gaur has instructed to start beautification work of Sonagiri crossing at the earliest. He said this during his tour of the area here today. The crossing will be beautified by Bhopal Municipal Corporation with public participation. For this, director of Quality Restaurant Mr. Jitendra Sachdeva has donated Rs. six lakh. Earlier, Mr. Gaur took stock of arrangements at late Purushottam Gaur Swimming Pool at Kalpana Nagar. He paid floral tributes to a portrait of late Mr. Purushottam Gaur. Mr. Gaur instructed to construct second entry gate of the swimming pool. He asked management of the swimming pool to keep up good arrangements over there. The Urban Administration Minister inspected a tube-well at Hathaikhera Pathar Basti in Anand Nagar. Mr. Gaur instructed to construct tube-well’s platform soon. Social worker Mr. Raghunandan Singh Rajput, Mr. Jitendra Sachdeva, Deputy Commissioner Bhopal Municipal Corporation Mr. G.P. Mali and others were present on the occasion.